10-31-2018 Todd’s Market Update - Trading Concepts, Inc.
U.S. markets wrapped up a volatile month with the S&P 500 and Nasdaq closing higher in back-to-back sessions for the first time since September. The recent rebound is signaling a possible near-term bottom is in but the rest of the week has a number of high profile earnings due out. The longer-term technical outlook remains slightly bearish but the major indexes could follow the Dow’s lead in making a run towards their 200-day moving averages on continued strength. Volatility is showing signs of easing but remains just above an uncomfortable level for the bulls. The Nasdaq surged 2% while testing a session high of 7,368. Fresh resistance at 7,350-7,400 held with a close above the latter being a continued bullish signal. 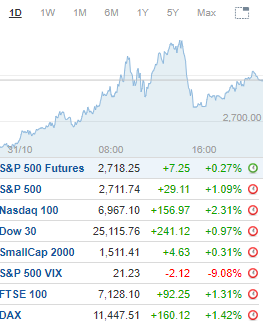 The S&P 500 jumped 1.1% after trading to a second half high of 2,736. Fresh and lower resistance at 2,735-2,750 held with continued closes above the latter being a more bullish development. For October, the Nasdaq was the worst-performing major index, dropping 9.2% and its biggest monthly loss since November 2008. The S&P 500 shed 6.9% for its biggest monthly decline since September 2011. The Dow was higher by 1% following the intraday push to 25,336. Near-term resistance at 25,350-25,400 and the 200-day moving average were held by the bears with a close above the latter signaling additional strength. The Russell 2000 added 0.3% after reaching a morning peak of 1,526. Near-term resistance at 1,525-1,535 held with a close above 1,540 being a more bullish signal. The Russell 2000 tanked 11% while the Dow sank 5.1% in October for its biggest monthly percentage fall since January 2016. Technology and Communication Services were the strongest sectors after rallying 2.4% and 2.1%. Financials and Materials advanced 1.4%. Real Estate and Utilities were down 1.4% and 1.2%, respectively, and were the weakest sectors. Consumer Staples was off 1% to round out the losers. For October, Utilities and Consumer Staples were the only positive sectors after rising 3.2% and 3%. Energy plummeted 11.9% while Industrials were hammered for an 11.5% loss. Consumer Discretionary plunged 11.3%, Materials were hit for 10.4%, and Technology tanked 10.1% to round out the double-digit percentage losers.